Twickenham Consultation – Reprieve or just a stay of execution? 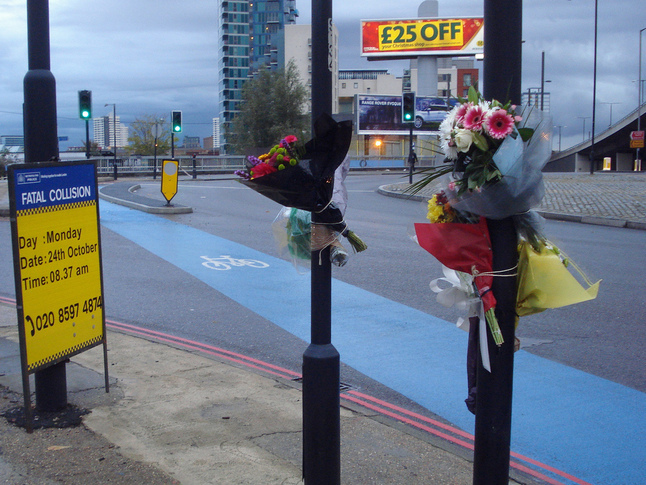 October marks the one year anniversary of the death of local cyclist Brian Dorling on one of the Cycle Superhighways at the Bow Roundabout near the Olympic Park, where poor road design contributed to making Bow such a dangerous junction, where two people were to die within the space of 3 weeks. It also marks the 15th birthday of the London Road Cycle lane which Richmond Council are planning to remove. If this means they listen to the safety concerns of those affected by the proposals that will be great. If it just means more communication about what they are currently proposing (i.e. installation of advisory off peak lanes which form part of the nearside motor lane) then it will be a disappointment. It does, however, show they now realise the original plans were inadequate. No matter how many ways they put it, sharing a lane with an impatient HGV at peak time is no more pleasant at 20mph that it is at 30mph (particularly when average speeds at peak times are closer to 10mph), and no number of Advanced Stop Lines at junctions will make cycling through Twickenham more pleasant if you can’t get to them in the first place. At peak times, when parents are cycling to school with their kids or people are cycling to work, the most protection is needed (57% of incidents occur at peak times). The council’s own safety audit of the plans, obtained via a Freedom of Information request, show there will be an increased risk of cyclist/motorist collisions under the new plans. Even the DfT states cycle lanes should be provided for roads with this volume of traffic, even at 20mph. 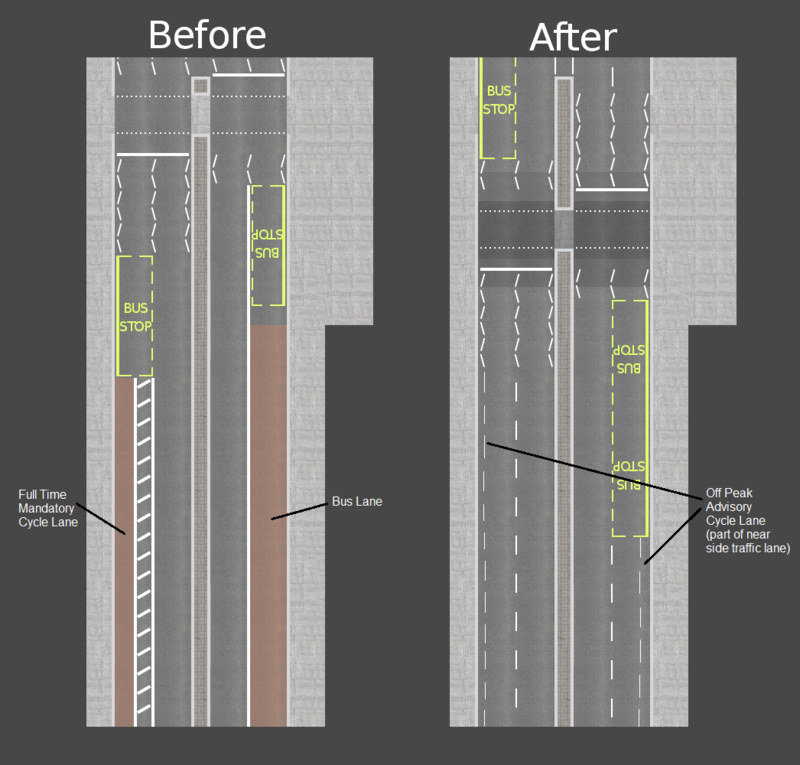 This is what you're losing - London Road before and after (thanks to Paul James for visualising for us) We would love to show you the actual layout, but the council haven't produced it yet. We need everyone who is concerned about what Richmond Council to make their voice heard while there is still time. Contact your local councillors, the council’s Cycling Champion, Kat Harborne, the chair of the Transportation Committee Councillor Chris Harrison and the Principal Transport Planner Ben Fryer. These are the people with the most influence on whether we lose the existing cycle provision in Twickenham. Thank them for listening to our concerns and putting back their ratification. Share with them your vision of an inviting Twickenham, where parents are happy to cycle to school or to the riverside with their kids, where those commuting to work at peak times aren’t sharing a lane with a HGV and where Twickenham maximises it’s potential as a place to visit. TfL are also a major stakeholder in the changes. We are in discussions with them, but we ask you all to share your concerns with them directly. And of course, put the Council cabinet meeting on the 15th November in the diary. This is the best chance to get your points put directly to the cabinet members responsible (full list of cabinet members and contact details here) You can even register to ask a question on the night. If you’re writing to your Councillor or the paper, feel free to cc us in via info@richmondlcc.co.uk and we’ll keep a note of it. They review why two motor lanes are required by TfL on London Road in each direction, given each end of the road is single carriageway. We would also like to counter some of the claims that the council has made in the emails that many of our followers have passed on to us. As an organisation, we’re saddened to be accused by the council of misrepresentation of their plans. We’ve only ever reported what the council has stated – the initial rejection by two thirds of the removal of the London Road cycle lane by their consultation and their plans to replace the existing cycle lanes and bus lanes with advisory, off peak only cycle lanes. 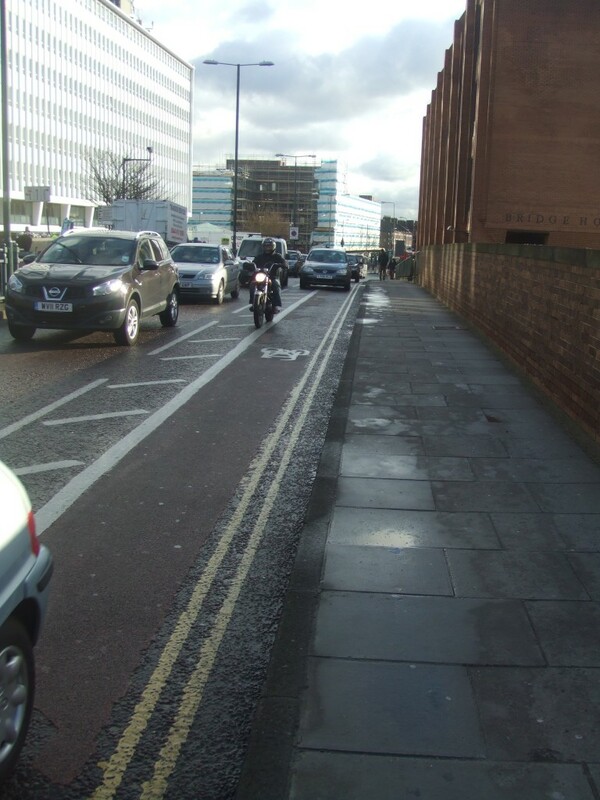 In the original proposals that formed the consultation, as far as we can see (and we’ve poured over them extensively) there was no mention of the provision of these advisory cycle lanes. We would expect that cycling facilities – including cycle lanes – to be designed into the road layout from the start and clearly articulated on the consultation documents. Since putting in any kind of bike lane may materially affect traffic flow and road-user’s experience (both cyclists and motorists) – this “bolt-on” approach of bike lanes is not the approach that would normally be taken in a major infrastructure project. Apple wouldn’t sell many iPhones if the designers weren’t mobile phone users, yet here we have road plans being pushed without taking into account the safety concerns of those who will have to use them. We’ve heard Cllr Harborne on several radio stations sharing her vision for the Olympic Legacy for the borough through the Strictly Cycling project in schools the council is involved in. Wouldn’t it be great to have a legacy which leaves one of the main parts of the Olympic route safe for families to cycle to school on? For the background to the proposals, going back to 2011, have a look at this post. This entry was posted in Campaign, Consultation and tagged Consultation, Cycle Lane, Twickenham by admin. Bookmark the permalink. How does the proposal link with the Active Travel ambitions of “Live Well Richmond” and the strategy of the Richmond Health and Wellbeing Board ? The last report of the Director of Public Health identified the rising number of obese school children in the borough. Surely making bike travel harder doesn’t help. Had a 30 minute questionnaire a few days ago enquiring how well Richmond Council were performing. When it came to method of transport; questions on whether I used buses, owned a car(s) or motorbike were asked. Never a mention; did I own or use a cycle. I rather think it’ not really on the agenda!? Even on the current design, why should the bus stop interfere with the bike lane? I say let the buses block the motor vehicles – they can wait behind the bus while it is at the stop! Councils keep saying their priorities are walking > cycling > buses > cars, yet here is a concrete example that the opposite is true. Great article. Balanced and to the point.